A true “island son”, Elias was born on the island of O’ahu & raised in the windward town of Kane’ohe. His musical influences, like most , began at home. His father played ukulele & sang. Elias’ grandparents were well known in the Waikiki music scene & performed with many of the greats of that golden period, such as Aunty Genoa Keawe, Marlene Sai & Sonny Chillingworth. 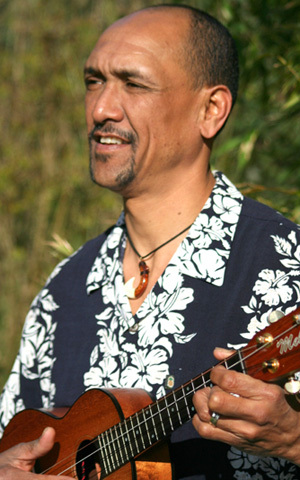 Elias attended Kamehameha Schools from 1973 to 1979, where he was selected to join the acclaimed Kamehameha Schools Concert Glee Choir & sang as a tenor alongside Tony Conjugacion, Lopaka Ho’opii, & Nephi Brown. His love for Hawaiian music was deeply ingrained under the guidance of his music instructors Robert Cazimero, Wayne Chang, Zillah Young & Dale Noble. He graduated in 1979 and, after several years of travel & military service, he returned to Honolulu where he met his wife, Lisa, a local haole girl. Elias has been a resident of the Puget Sound community of Richmond Beach, Washington, since 1995. Elias also works part time at Hawaiian Airlines in Seattle. Next time you are travelling to the Islands via Hawaiian Airlines, you may see him at the ticket counter or serenading guests at the boarding gate.